There is not one good reason but there are 10 good reasons, and even more, to attend the 13th edition of the Bikers’Classics, the largest European event for old motorcycles, on 3, 4 and 5 July. Small in displacement but big in performance, the 50, 80 and 125 cc’s with which the champions rode their first laps on track. These are put in the spotlights this year. A unique opportunity to (re)discover these extraordinary examples of fine art. The Second World War was barely over when the mechanical industry in Europe revived. 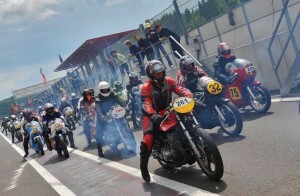 The parade dedicated to the Moto GP’s from the 50s and 60s will show the new wind that shook the motorcycle world placing factory drivers and private drivers opposed to one another. You will certainly not regret your visit to our Lifestyle Village in the paddocks at the foot of the Uniroyal Tower. You will discover the latest creations of the most skilled motorcyle tuners. Or how an ordinary machine can suddenly become a mechanical icon. Art with a capital A! 4. On the big track! It’s been a recurring tradition for a few years now. Together with the participants of the Bikers’Classics you can explore the sensations of the “big” 14 km track. A lap of honor is provided for the members of the clubs present at the event. As usual, there will be a party untill the early hours in the night from Saturday to Sunday to the music of the Classic 21 concert. On the program the Aberdeen group that will play all the hit songs of Nirvana. Not to be missed! During four hours, endurance specialists will race one another aboard their classic machines in the framework of the European Classic Series. With a real start in endurance style, scheduled and surprise pit stops and especially one big question: who will at the end of the game break the dominance of the duo Hubin-Fastré? The favorites and outsiders are ready for it! In 1975 Julien Van Zeebroeck surprised everyone. 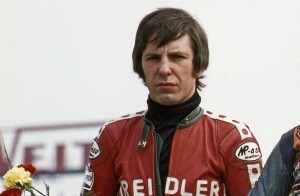 He was never world champion but his fantastic victory in 1975 on the track of Francorchamps with his Kreidler 50cc will remain an unforgettable moment for all Belgian fans of speed races. Between the parades and tributes you will also get to witness some races. After the specialists from the endurance you can see the participants of the CSBK, the BCGP and Proclassic at work in the framework of their respective championships. Collectors can enjoy themselves at the Fair where they can look for that one missing piece to restore their vintage motorcycle. Visitors can visit the commercial village to rummage among the tools, antiques, clothing and especially the 2015 Bikers souvenirs. 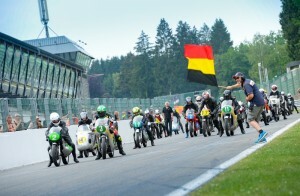 The program would not be complete without the opportunity for amateurs to ride on track. There are five track sessions for old small cc’s up to Superbikes.